For children ages one through age six. Remember that each child develops at his/her own pace and the information below is for informational purposes only. You are your child’s best advocate and know your child best. Let your pediatrician know if you have concerns about your child’s development. 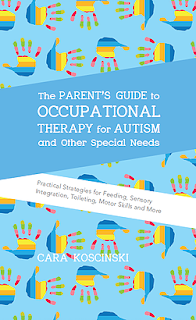 AWARD-WINNING book for new OT grads, parents, and others. All of the most frequently asked questions pediatric OTs receive. Handwriting, daily living (haircuts, baths, and dressing), toileting, behaviors and SO much more! Asks many questions, asks “who?” And “why? Click here for information on sensory processing disorder.